Official Federal Office: 10/229 Balaclava Road, Caulfield North. Victoria. Australia. 3161. Applicants should state whether they are W.I.A. Members and, if so, list their membership number. Where relevant, changes in Callsign and dates of such changes should be indicated. Applications (Official Hard copy or Computer file) should be sent to the W.I.A. Federal Awards Manager. Contacts for the awards can be made from all call areas, pertaining to the same country unless otherwise stated. or operations to or from sea-going vessels (maritime, mobile or stationary). Exception for permanently registered docked exhibition vessels or historic ships considered land based. All contacts must have been made after 1st. January 1946, unless otherwise noted. interpretation of these rules shall be final and binding. 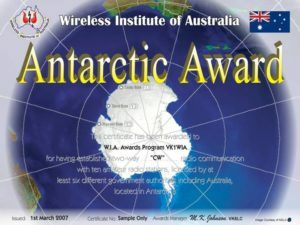 Applicants need to hold QSL cards for all QSO’s claimed. However, “do not send QSL cards” with your application. Callsign of station contacted, Date, Time, (RST optional), Mode and frequency as shown on the data sheets. 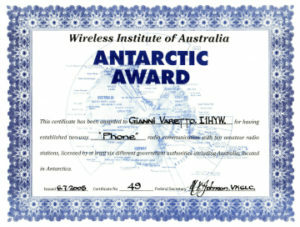 sheet a declaration signed by an official of a recognized Society or by two licensed Radio Amateurs. Signatories to the declaration should clearly indicate their Names, Callsigns and dated. It is recommended you use our W.I.A. official computer formatted documents for all awards and updates. Where a fee is payable this should be sent with the official application to the Federal Awards Manager. 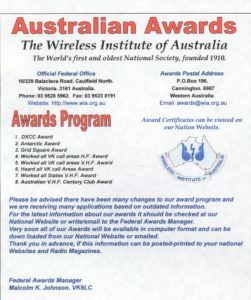 Free to all Wireless Institute of Australia members. Ten (10) Australian Dollars ($10 Aus) to Australian non-members. Ten (10) American Dollars ($10 US) or equivalent rate of exchange value in IRC’s for all overseas applicants. The fees cover registration, Award Certificate, postal container, email, local and international airmail postage. authorities, of which one (1) must be a VK0. latitude. (This excludes Heard, Macdonald and Macquarie Islands, being sub-Antarctic). Only contacts made on or after the 23rd February 1988.